Not seen since running second in the Grade I Breeders' Cup Juvenile last year, exciting colt Carpe Diem (3c Giant’s Causeway x Rebridled Dreams, by Unbridled’s Song) indicated he will be a force this year when cruising to an impressive victory in the $350,000 Grade II Tampa Bay Derby on the weekend. A $1.6 million OBS March 2YO Sale purchase, Carpe Diem earned high praise and TDN Rising Star status for his powerful debut win at Saratoga last year and followed it up with a Grade I win in the Claiborne Breeders Futurity at Keeneland. His only subsequent run was his Breeders' Cup second, but judging by this performance the Todd Pletcher trained son of champion sire Giant’s Causeway will be winning many more races. Despite proving difficult to load at the gates, Carpe Diem had his mind on the job when the field jumped moving swiftly to take up a forward position just behind the leaders before powering clear to win the 1 and 1/16th mile contest by five lengths. "He was very fresh warming up and when they finally got him into the gate and I got on, he settled down," said winning rider John Velazquez. "We broke very well and I took a position just where I wanted to be, right behind the leaders. He rated very well and I was able to wait with him until nearing the stretch. When I asked he came away very nicely." 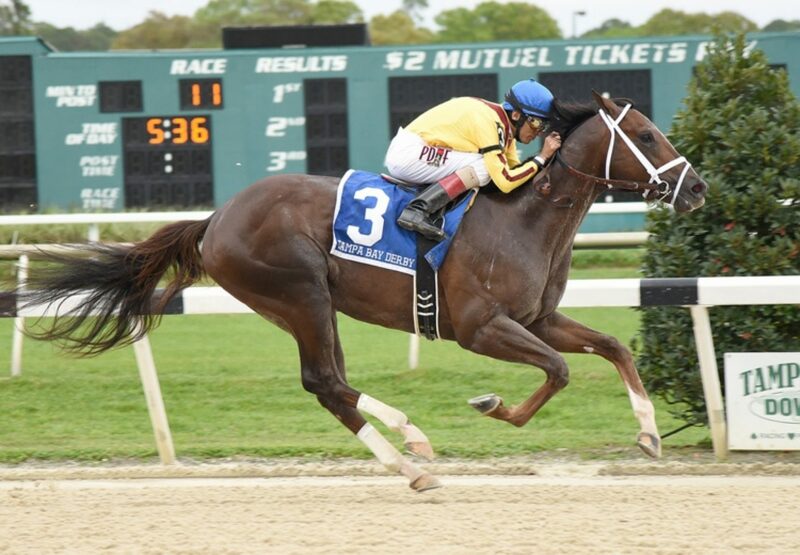 Carpe Diem has now won three of four starts earning $919,800 for his owners WinStar Farm and Stonestreet Stables. “Wow. When they leave their 2-year-old season behind, you hope they come out like he did,” said co-owner WinStar President Elliott Walden. “Everyone who has watched him train said he has been training better than any horse in Florida, and it’s nice to see him put it together like that. He is just a natural athlete and has a great rhythm to him. We missed him as a yearling, but thankfully John [Moynihan, representative for co-owner Barbara Banke’s Stonestreet Stables] and I got together on him as a 2-year-old.” Carpe Diem is a half-brother to Grade I winner J.B.’s Thunder and stakes-winner Doncaster Rover being the fifth winner from stakes-winner Rebridled Dreams.